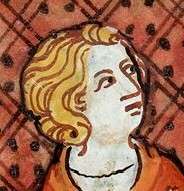 Fulk IV (in French Foulques IV) (1043–14 April 1109), called le Réchin, was the Count of Anjou from 1068 until his death. The nickname by which he is usually referred has no certain translation. Philologists have made numerous very different suggestions, including "quarreler", "rude", "sullen", "surly" and "heroic". He was noted to be " a man with many reprehensible, even scandalous, habits" by Orderic Vitalis. ↑ It is entirely plausible that Fulk may have made use of scribes to write this work. See: Nicholas L. Paul, The Chronicle of Fulk le Rechin: a reassessment, Haskins Society Journal 18: Studies in Medieval History, 2006, eds. Stephen Morillo; Diane Korngiebel (Woodbridge: The Boydell Press, 2007), pp. 19–35. ↑ It remains uncertain whether Philip had her taken by force or whether she left Fulk of her own accord as chroniclers presented differing versions. See: Bradbury, The Capetians (2007) p. 119. ↑ Orderic Vitalis (1973). Chibnall, Marjorie, ed. The Ecclesiastical History of Orderic Vitalis, vol. IV. London: Oxford University Press. p. 187. ISBN 9780198222286. ↑ Louis Halphen; René Poupardin, eds. (1913). "From Chroniques des comtes d'Anjou et des seigneurs d'Amboise". Paris. pp. 232–38. Retrieved 2009-07-20.